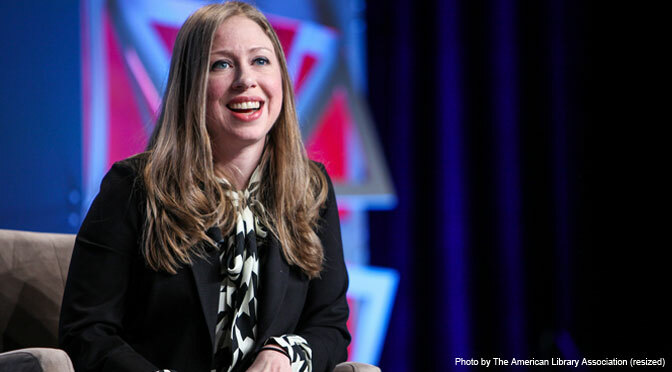 Chelsea Clinton: Abortion is "at the core of our human rights"
Last week, Hillary Clinton hijacked the Democratic debate to talk up abortion, saying that abortion “goes to the heart of who we are as women.” Now her daughter, Chelsea, is borrowing some of her mother’s talking points on the campaign trail. Chelsea, who herself is pregnant with her second child and claimed that she left the Baptist church because she disagreed with it’s pro-life stance (at the age of six, no less), spent time in Poughkeepsie, New York, discussing her belief that abortion is a human right. After taking a break from attacking her mother’s self-described Democratic Socialist opponent, Bernie Sanders (who is also pro-abortion), Chelsea spoke to a crowd of about 100 people, saying, “A woman’s right to choose is at the core of our human rights and what should be equity in our country.” It’s an interesting choice of words, to say the least. What about the human rights of preborn children, Chelsea? What about equal rights for them? Scientifically speaking, there’s really no doubting the humanity of preborn children. They have their own unique DNA, beating hearts, brain waves, organs — we know, beyond a shadow of a doubt, that these are human beings. So what about their human rights? If we’re going to fight for human rights, then we must fight to end abortion. One of the very first rights mentioned in our founding documents is the right to life – given by our Creator, not by the government – yet millions of human beings are being deprived of that right without due process, simply because of their location. And it happens despite scientific advances that have made their humanity utterly irrevocable. It’s not something that we can question anymore. We know that preborn children are human beings. Sorry, Chelsea… if you’re advocating for the right to kill human beings, then you can’t possibly be advocating for human rights.